Once upon a time a baby girl was born in a house beside the sea. Her daddy made up fun stories of sailors and pirates, of mermaids and sandcastles and ice creams and he was good at drawing pictures too. He drew pictures of whales and sharks and jelly fish – and a boat called “Spider”. A few years later the little girl’s daddy made up an exciting story about a trip on an aeroplane. And it came true! 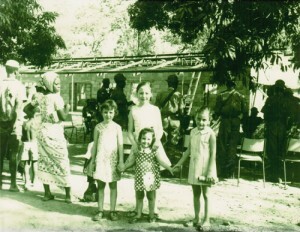 With her mummy and daddy and sisters the little girl left the seashores of England for a new life in Africa. …swam and dived, sometimes backwards, every afternoon and sang songs in the sunshine at school. The little girl loved her nanny who was called Grace. Together they walked and talked and played in the sandy garden where they saw crawling snakes, scuttling lizards and poisonous scorpions! Grace taught her to speak in Hausa, the local language, and when war broke out her mummy and daddy hid Grace in their house to keep her safe. The little girl’s daddy made up stories about elephants and tigers, about crocodiles and lions and spiders that lived in banana trees. Her mummy was very good at making dresses, doing difficult crosswords and teaching music. One day her daddy made up a story about a journey on a big ship that sailed all the way back to England . And it came true. The little girl was a bit bigger now and she sailed across the stormy seas with her family to join her cousins at a big house in Dorset called Orchard Corner. Orchard Corner had swings in the apple trees, tennis courts where they held bonfire parties, badminton courts where they held country dances and old stables that had a lot of interesting old junky things. There were lots of fruit gardens and cats and dogs and blackberries all around! The little girl loved it there because her two grandmas lived nearby and she made daisy chains in their gardens, and they gave her pink pop to drink and fish and chips and chocolate fingers for tea. Her auntie was a brilliant artist and taught her how to look at the detail of simple things like bird’s skeletons and shells. The little girl and her cousins played lots of musical instruments like the piano, the clarinet, the flute, the viola, the guitar, the cello, the trombone, the French horn and they all sang so there were lots of musical evenings and parties at Orchard Corner. Her daddy made up lots of stories about daffodils and tree houses, about country dancing and maypoles and about horses and pets. One day he made up a story about a journey in the car all the way up to Yorkshire. And it came true! The little girl was a bit older now and she settled with her family in a small Yorkshire village which was surrounded by lots of coal mines. She made lots of friends and enjoyed school where she played netball and joined an athletics club because she liked running and long jumping, played the clarinet in a concert band, acted in theatre groups and read lots of books from the library. She was lucky because one teacher told her she would be a writer when she grew up and she believed her! When the little girl grew up she got on a train to London to work in television where she started writing children’s stories. She became a mummy herself to two little girls and one of them was frightened of spiders! So she thought about what her daddy would have done and she made up a story about a dancing spider. Then she wrote more and more and more …and lots of those stories became books. and that is how I started to write stories for you. All illustrations in Hilary's story were drawn by Melanie Sharp.